​Halloween has arrived! Yes, while Halloween time does mean candy, it doesn’t have to mean rotten teeth or high blood sugar! I am so excited to announce that for the next YEAR, I will be teaming up with Crest to promote healthy teeth and beautiful smiles! You can circle back monthly to see that month’s message from myself and Crest! First- let’s close out this month with some Halloween fun! Hi Friends! Super exciting news! I had the opportunity to create some simple but tasty low carb snack recipes for Healthline.com! There is a crunchy, savory and sweet option for all your cravings! Click HERE to check them out! Let me know if you try them for yourself! 2 Girls. 2 AutoImmune Diseases. 2 Stories. ​Hi friends! I have a really special treat for you today! Please help me in welcoming Becca from Cooking with Confetti to GlitterGlucose.com! Becca is a woman of many talents and happens to live with an autoimmune disease also… but I’ll let her introduce herself below! If you are like me, you love any reason to get dolled up and throw on a pretty dress! Now if the occasion happens to support Type 1 Diabetes research then that is a MAJOR plus in my book! Back in May, I was able to attend the JDRF Imagine Gala in Los Angeles, CA. JDRF hosts galas nationwide as a big fundraiser for Type 1 Diabetes research. If you have ever wondered what goes on at a JDRF Gala, I am here to share! Nope, you didn't read that backwards! ​I’ve been attached to my insulin pump every day for the past 3 years. Even though I LOVE and value my pump VERY much, I have long dreamt of a “pump break” but I could never commit. I always thought I was brave and could just “cut the cord” and be fine. When it came down to taking my pump off suddenly all these questions and fears came to mind. Would I even remember how to calculate the proper dose? I haven’t had to think about the math and numbers that go into injections in a LONG time. Would I really be diligent in recording my blood glucose numbers and time/amount of dose given? Probably not. The biggest thing for me was how I would keep track of insulin on board? My insulin pump is SO helpful in helping me avoid stacking insulin and going overboard when correcting and dosing. My insulin pump does so many things that multiple daily injections just can’t offer me… until now! Hi Friends! 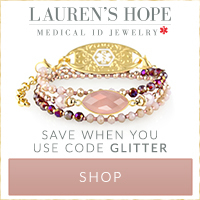 ​I was recently featured by Lauren’s Hope Medical ID Jewelry! Click below to read my “Story of Hope.” I talk all about my diagnosis and how I am able to show off my personality and love for fashion even with diabetes. ​On May 5th I was able to host an amazing event with Dermalogica in Scottsdale!!! I feel so incredibly blessed to have made friends with the girls at Dermalogica. They have been so kind to me and my followers ever since I met them in August 2017. Dermalogica is not a company specific to diabetes but the way they have come out to support me and the T1D community has been truly beautiful. If you have the opportunity to stop by the Scottsdale location, please thank them for supporting the Type 1 community! ​Flying by air can always be a little nerve racking. “Did I bring enough? I feel like I forgot something? Is TSA going to be an issue? Will my carry-on be allowed?” Now add Type 1 Diabetes to the mix and suddenly all those questions are elevated times a million. There have been many conversations about traveling with Type 1 on my Instagram (@glitterglucose) so I thought I should make this post as a reference with all the info you need to know when flying! ​I am so excited to FINALLY share an amazing product that I have been testing and using since March 31. When I first heard the concept of this product, I thought it was too good to be true. I have needed something like this since diagnosis! When I heardit actually existed I had to put it through the ringer and make sure it was actually fulfilling the need I was desperate for! Here we are! I loved it, it has saved me and now I get to share with you! + I have a coupon to share! ​(Code: Glitter for 20% off! ​If you’re reading this you are probably close to the happiest day of your life! Congrats! Diabetes never takes a day off- not even on your wedding day. Everyday diabetes is about preparation and your wedding day is no different. By reading this, you are already off to a great start! I’m sharing some tips with you that can help you enjoy your special day even while diabetes lurks in the background.